The perks of dry cleaning are that you don’t have to think about washing your clothes once you drop off your order. For those who are curious about the process, here’s how it works. To put it in simple terms, dry cleaning a process that cleans clothes without the use of water. Dry cleaning uses a non-water based chemical solvent to clean clothes. 1. Tag & Inspect: Small tags are placed on the garments. This is how we identify your clothes. Next the clothes are examined for any stains, missing buttons or tears. 2. Pretreatment: If any stains are found, the cleaner treats them before dry cleaning. 3. Dry Cleaning: The clothes are placed in a machine and cleaned using a special dry cleaning fluid, and without the use of added water. 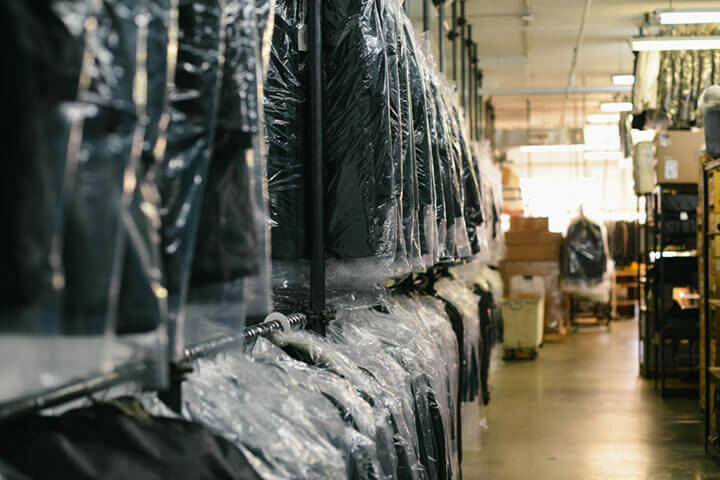 The dry cleaning fluid is extracted in a light spin cycle, and then the clothes are tumbled in warm air in the same machine to evaporate any remaining liquid. 4. Finishing: Garments are then steamed or pressed, hung and a placed in a protective poly bag.